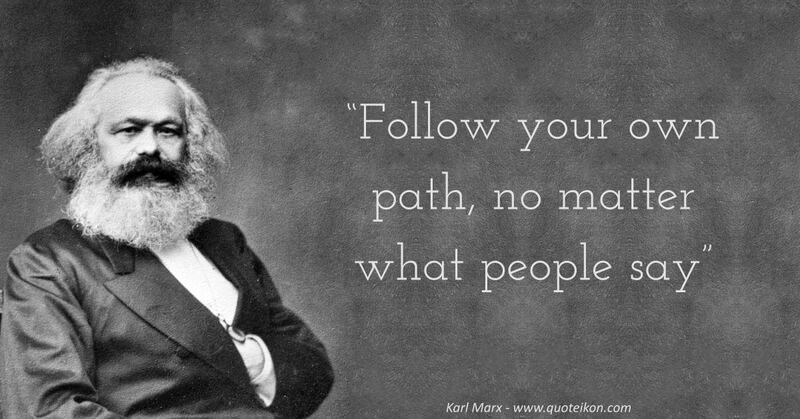 Quotes about Karl Marx: Che Guevara was inspired to say "The merit of Marx is that he suddenly produces a qualitative change in the history of social thought. 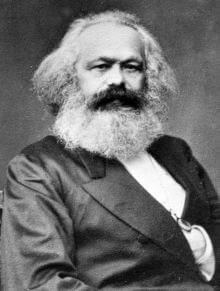 He interprets history, understands its dynamic, predicts the future, but in addition to predicting it (which would satisfy his scientific obligation), he expresses a revolutionary concept: the world must not only be interpreted, it must be transformed. Man ceases to be the slave and tool of his environment and converts himself into the architect of his own destiny"
The philosopher Moses Hess drew high profile comparisons when he said of him: "Try to imagine Rousseau, Voltaire, Holbach, Lessing, Heine and Hegel all rolled into one — truly united so as to make a unified whole and you will get an idea of Marx's makeup"
The author Nassim Nicholas Taleb talked of his psychology: "Karl Marx, a visionary, figured out that you can control a slave much better by convincing him he is an employee"
"My object in life is to dethrone God and destroy capitalism"
"History is not like some individual person, which uses men to achieve its ends. History is nothing but the actions of men in pursuit of their ends"
"Material force can only be overthrown by material force, but theory itself becomes a material force when it has seized the masses"
"Last words are for those fools who believe they have not yet said enough"
"Follow your own path, no matter what people say"
"I do not like money, money is the reason we fight"
"Every emancipation is a restoration of the human world and of human relationships to a man himself"
"The proletarians have nothing to lose but their chains. They have a world to win"
"The circulation of capital realizes value, while living labour creates value"
"No production without a need. But consumption reproduces the need"
"A man cannot become a child again, or he becomes childish"
"Luxury is the opposite of the naturally necessary"
"Every beginning is difficult, holds in all sciences"